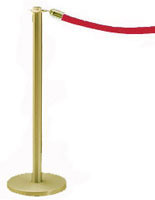 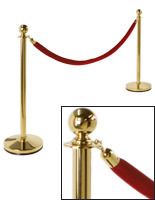 This Traditional Crowd Control Stantion is Polished Brass and has a 6 ft. Black Velour Rope. 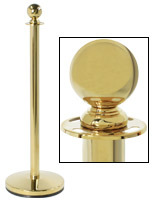 This is a lighter weight, lower cost alternative to other traditional posts we are selling. 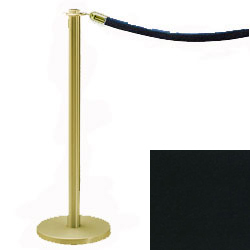 Included in the price is one Polished Brass Traditional Post along with a 6 ft length of black velour rope which includes the necessary 1 1/2" Snap Rope Hooks in the matching Polished Brass finish. 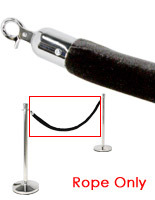 For the last rope in your series, you will need either a Post without a rope or a Wall Plate Hook. 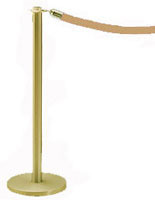 We have both for sale; details can be seen in the related products section at the bottom of this page. 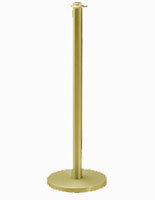 The post is 34-1/2" High with a 13-1/2" Round Base. It weighs 25 lbs.